Back-to-back Martha nights. Flipping through (one of her many) cookbooks this past weekend, I was drawn to a recipe so simple, so straightforward, I was surprised Martha bothered to devote two whole pages (granted, one is a full-blown, gorgeous picture) to it. Could making tasty chicken be as simple as sticking it in the oven? Martha: challenge accepted. Preheat the oven to 400 degrees. Slice the tops off from the garlic heads and reserve them. Arrange the tops, cut sides down, in the center of a baking dish. Lay the herbs over the garlic, place the chicken over the herbs, and put another sprig of herbs over the chicken. Arrange the reserved bottoms next to the chicken in the pan. Drizzle the chicken and the garlic with olive oil. Season chicken with salt and pepper. Roast the chicken for 25 minutes or so, or until cooked through. If you’re using skin-on breasts, continue roasting until the skin is browned and juices start to run clear – you’ll want to save the juice to drizzle over the top at the end. Bring a large pot of salted water to a boil; cook the broccolini for about a minute, or until bright green. Drain. Heat a medium saute pan over low-medium heat and toast the pine nuts until golden brown, about 3 minutes. Remove from the pan. Add olive oil and heat through. Add the broccolini; toss with salt, pepper and crushed red pepper. Cook about 3-5 minutes, until heated through but still crunchy. Toss the broccolini with pine nuts, lemon juice and parmesan cheese, if you so choose. 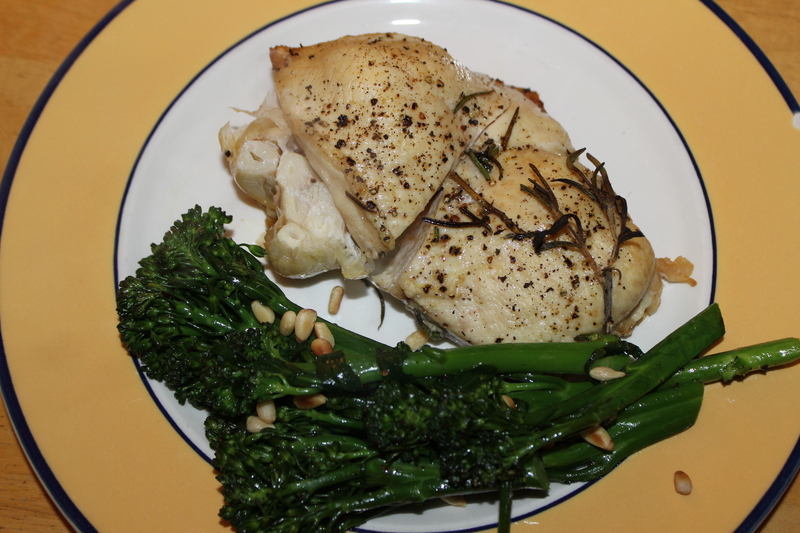 Serve the chicken and broccolini with crusty bread – I drizzled a loaf with olive oil and rubbed the extra roasted garlic and heated it through. not nearly as pretty as martha’s picture, but it’ll have to do.